Do you have a dog that suffers from anxiety? While I wish things were different, I must admit, Ivi suffers from anxiety. While I have tried not talking about it much on the blog, she took Reya’s sudden death hard. Don’t get me wrong, she never liked to be left alone, but nothing prepared us for the horrible separation anxiety. Now, add to the fact that they are also scared of fireworks and you can see that this has been a very interesting summer in our household. What is worse is how much it breaks our hearts seeing Ivi so terrified and crying for her life she thinks she will be alone, telling us something had to be done. Our problem, however, was nothing we had used on Reya or her as a puppy was working. Honestly, I was worried we were going to have to consider medication for her anxiety. To my surprise, however, I was approached at BlogPaws about a new product that was designed to calm dogs without medication and relieve stress – the Calmz Anxiety Relief System. Looking for a non-invasive, drug-free solution to help reduce your dog’s anxiety? If so, we think you will love Calmz Anxiety Relief System. 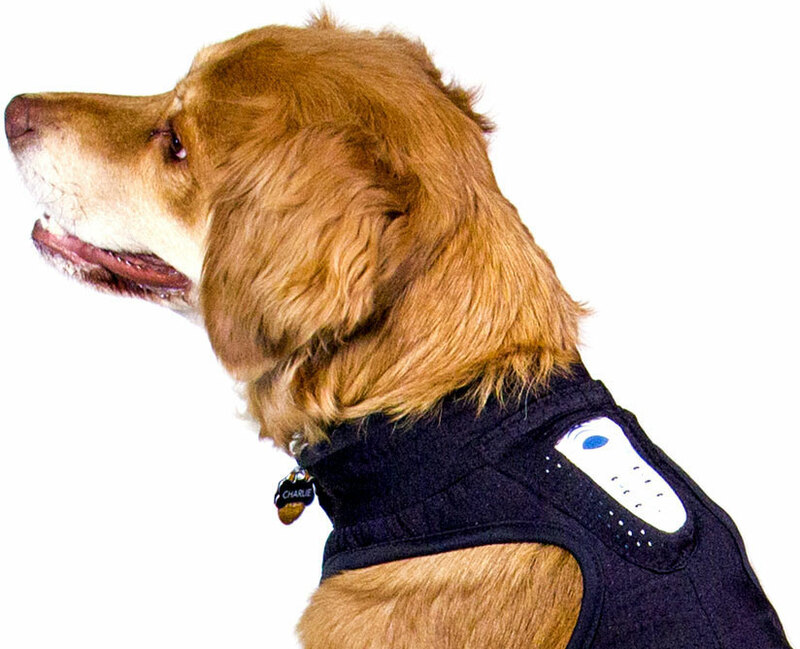 This system was designed by a dog owner with a background in medical devices, neurostimulation, and biologic regeneration, who put his knowledge and expertise to use to make a concept and prototype to relieve his dog Mile’s anxiety. 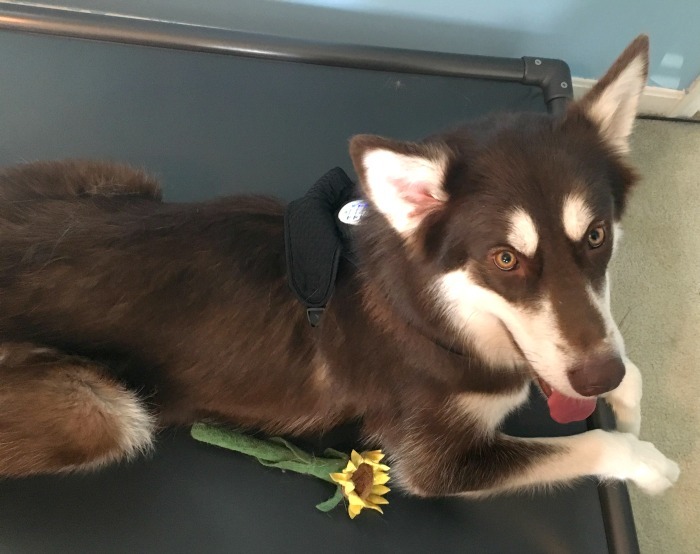 Before long, his design became the Calmz Anxiety Relief System and was considered by experts to be the perfect combination of treatment location, therapeutic stimulation and size. 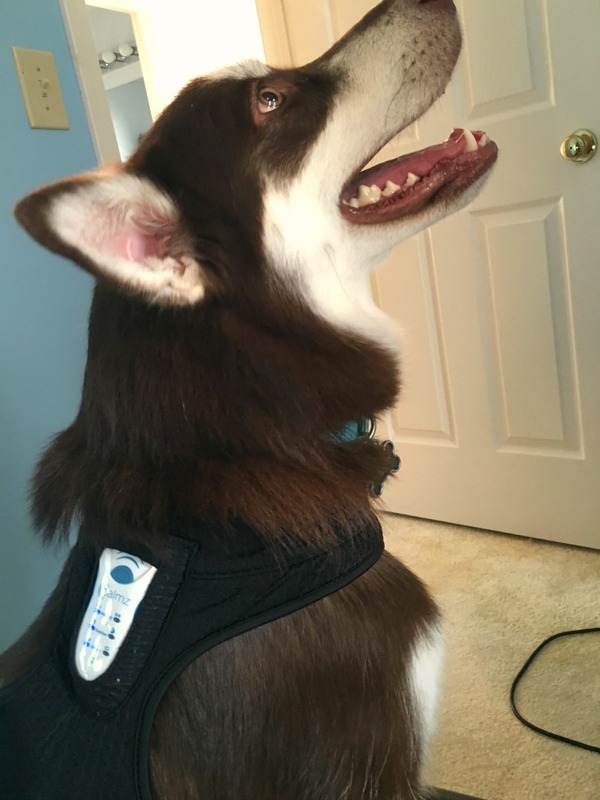 Tested by leading veterinary behaviorists, what makes this system work is a soothing blend of classic music, mild vibration, and calming tones that come from a small remote like device that fits inside of a vest worn by dogs. To learn more, make sure to watch the video below! While we have not had a great deal of time to test the Calmz Anxiety Relief System with Ivi, I have to say that we like the results so far. From the moment she heard the little music and buzz of the remote, Ivi was excited and curious. Having worn some clothes and used to a harness, she didn’t mind the vest at all, only being disappointed when she learned that the vest didn’t mean a walk. Being her happy, cheerful self though, she was happy to wear it around the house and then sit back and relax, enjoying the gentle buzz and music. When she was left alone, she didn’t seem to mind too much, focused more on the music and buzzing. Even though it may be too soon to tell, I love how much this system relaxes her and puts her at ease, making one of the most exciting pieces of pet tech I have seen in a long time. Want to purchase this system for yourself? You can buy the Calmz Anxiety Relief System on the Calmz website for only $129. Want to learn more? Check out Calmz on Social Media! I will have to look into this for my Pug Buddie. He is a rescued dog who someone just left in front of our house with hip problems. He goes through a lot of stress when I am not home and takes me a long time to calm him down. I really don’t want to go the medicine route as he is on so much now for his hip. Thank you for letting us know about the product. I wish that this product would have been available years ago. I had a dog who was very scared of loud noises. It was so bad that the dog would try to go through doors and walls. I just read an article yesterday about a local vet who left a large practice to have his own small one so he could get to know the people and pets better, his article was about pet anxiety. He talked about pets and drugs, but not this. What a cool idea! My dog needs this before vet visits and thunderstorms. She gets so upset at these times. We have a German Shepherd who is very anxious during storms, and this might certainly be worth a try. He is always trying to get into bed with one of us if it happens at night, and since he know that is not allowed, it is rather sad to see how close he can get to the bed! I love the idea of this product. I can see it being soothing to dogs. And the price is fair! Any German Shepherd needs Calmz. He suffers from separation anxiety. I have thought of using this for thunderstorms and loud sounds but you never know when it’ll happen and if you’ll be home. My golden retriever would have benefited greatly from. My little chihuahua would go crazy because she is always hot; especially in the summer months. i didn’t know that dogs get anxiety. interesting article. My dog could really use this. She is very afraid of anyone who is not part of the family and it makes it difficult when people come over to visit. She just gets filled with anxiety. OMG my brothers dog needs this. The dog stayed with me once when they were on vacation and I did not know about his fear on thunder and lightning. There is nothing like waking up from a nap when a 150 lb German Shepherd lands on stop of you. I was screaming get off, get off. A experience I don’t want to repeat. You took my breath away on this great anxiety relieving system. I can’t wait to get one of these, so my anxiety can go down. This is for dogs, not humans. My dog needs this during rain and thunderstorms. My dog likes wearing clothes so I think he would have no problem wearing this around the house. How interesting! Our dogs get lots of anxiety around the Fourth of July and New Years, when people set off fireworks. I wonder if this would work for them! These are some very educational and informative information that i can use to help me dogs. I really enjoyed the video as well as those helpful tips thanks for this blog its great. I will have to look into this further, thank you so much for sharing. My doxies have terrible anxiety when it comes to storms. Great post, I’ve only had one dog that suffered from anxiety and this product would have been awesome for her. I didn’t know such a product existed! Very good idea! 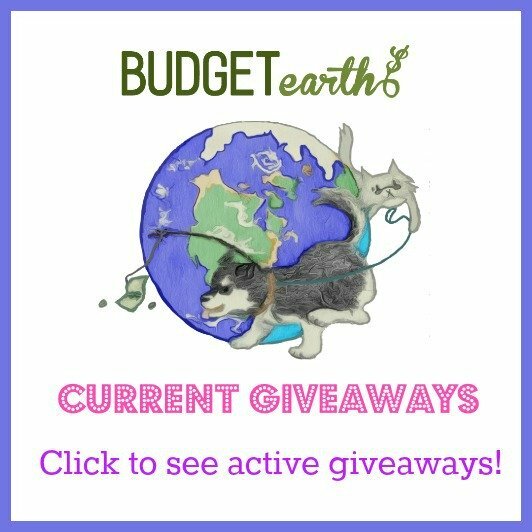 Great tips and ideals for your pets. Im gonna do what you said to help keep my dogs calm. Wish it would work with them being afraid of anything. My dog isn’t really anxious but everything scares the crap out of her. This will be something I will have to look into for my Buddy; he has seizures and has issues with car rides; he also had an altercation with the neighbor dog and has anxiety over seeing him. My sister-in-law’s dog could totally use this! I’m gonna tell her about it the next time I talk to her. Thanks!